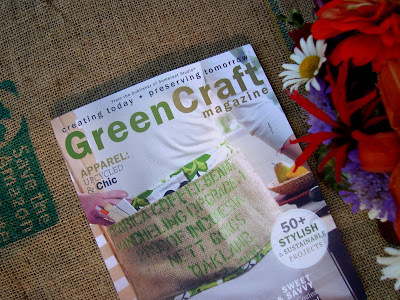 I had such a wonderful surprise in my mailbox: the premier edition of GreenCraft! It's Stampington's newest publication and my absolute favorite. Even if I didn't have my very own feature in it, I would consider it to be a new favorite magazine. When GreenCraft's lovely editor first contacted me, I was almost as excited about the concept as I was about being published in it. 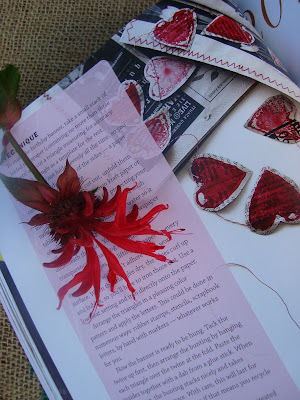 My love for recycled newspapers has a beautiful spread and I'm absolutely thrilled! If you're familiar with any of Stampingon's other magazines, you know they are really more like beautiful art books. This magazine is no different, except in GreenCraft almost every ingenious project has the instructions to go with them. Eco-art at its very best! Lots of new twists to transforming everything from vintage pieces to rescuing materials from your recycling bins. And of course, some good coffeesack ideas are included... because we all know how incredible burlap is! I love that it's on the cover! Not my apron, but so happy to see it front row and center! There is enough gorgeous upcyling to make me swoon! Serious green bliss... I haven't been asked to promote like this... just can't help it. Taking a deep breath now... and smiling wide. Talk about a sweet birthday present! Yay! I am the first to say CONGRATULATIONS!!! p.s. the word verification for this comment is "motion". i just love it when the random characters are actual words. Congratulations! This is really great and you totally deserve it! Congratulations!!! can't wait to pick up a copy!! Stampington makes the most beautiful magazines, the kind you want to keep forever. hello, wow that does look shiny!! is it worth purchasing a copy.... as I have to have it shipped to the UK.... it does look very good indeed! you have a great blog by the way!! How exciting....I had to order it before I could even add a comment here. So thrilled Stampington took a step in this direction. We will have to keep their pages filled with more green art! So cool that it all timed out with your birthday too! yes...visit soon...we will make it happen!! I can't wait to see an entire book devoted to Maya*made green crafting. You look so good in print. Oh that mag looks right up my alley! Well done you for being featured in it. All the way from Oz- Love your work. Looks like another mag to add to the wish list! 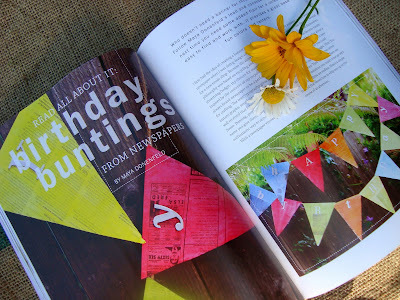 LOVE your bunting flags- so cool! thanks friends! so fun to share my excitement with all of you! Congratulations again Maya! Looks like a lovely magazine. I love their others, and now I'll have to look for this one, and the article featuring you! Yea!! Maya this is fabulous. I love the layouts and how everything turned out. Yeah for you! This looks like a great magazine! We are moving home to Ohio from the UAE in a couple weeks and one of the things I have missed most is reading magazine! I'm looking to add some new subscriptions when we get home and this might be one of them! Thanks! It's a hard time to be starting up a magazine now but this looks like a great one to support. Looks like a great magazine, I'll definitly have to check it out! WOW! I am so impressed and thrilled for you! And I am going to go and get that magazine! YAY! You're doing it, sister!! OMG. Fish friend you did it. Thanks for sharing with us. Wow. yay! Just ordered myself one. I can see that you are an expert at your field! I am launching a website soon, and your information will be very useful for me. Thanks for all your help and wishing you all the success in your business. Please come visit my site Junk Collection when you got time. You got a really useful blog I have been here reading for about an hour. I am a newbee and your success is very much an inspiration for me. Please visit my site Gym Equipment when you got time.